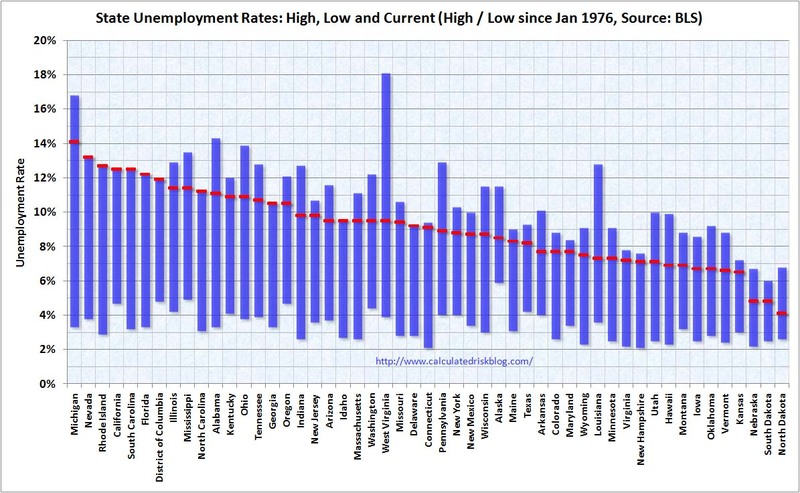 The latest unemployment stats (Feb 2009) by state are out at BLS. Nationally, it’s still an ugly picture. But for Michigan, which has been through so much pain, things are still continuing to improve. Slowly, but it’s the right direction. The rate is now down to 14.1% from a high of the mid-15’s last year. We still ‘lead’ the nation, but by a much smaller margin. Nevada, Rhode Island, Florida and California are catching us. Overall this is really a mixed picture for Michigan. It confirms what I said last summer that MI was the pioneer in this recession. We took our hits hard and early. But with the smooth exit from bankruptcy for GM and Chrysler, and with a rejuvenated Ford, Michigan is slowly starting to improve. Unfortunately, the actual real increases in employment (as opposed to fewer people looking) are concentrated only in healthcare and education. We need manufacturing to grow. But manufacturing can’t really grow until and unless those other 49 states turnaround and grow too. They buy what we make. 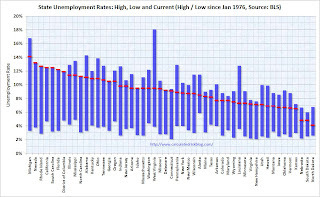 Twenty-seven states recorded over-the-month unemployment rate increases, 7 states and the District of Columbia registered rate decreases, and 16 states had no rate change, the U.S. Bureau of Labor Statistics reported today. Over the year, jobless rates increased in 46 states and the District of Columbia and declined in 4 states. Michigan again recorded the highest unemployment rate among the states, 14.1 percent in February. The states with the next highest rates were Nevada, 13.2 percent; Rhode Island, 12.7 percent; California and South Carolina, 12.5 percent each; and Florida, 12.2 percent. North Dakota continued to register the lowest jobless rate, 4.1 percent in February, followed by Nebraska and South Dakota, 4.8 percent each. The rates in Florida and Nevada set new series highs, as did the rates in two other states: Georgia (10.5 percent) and North Carolina (11.2 percent). Four states and set new series record highs: Florida, Nevada, Georgia and North Carolina. Three other states tied series record highs: California, Rhode Island and South Carolina.